As I mentioned last Tuesday, here are some more of the quilts that helped use up my scraps and were donated to local organizations. 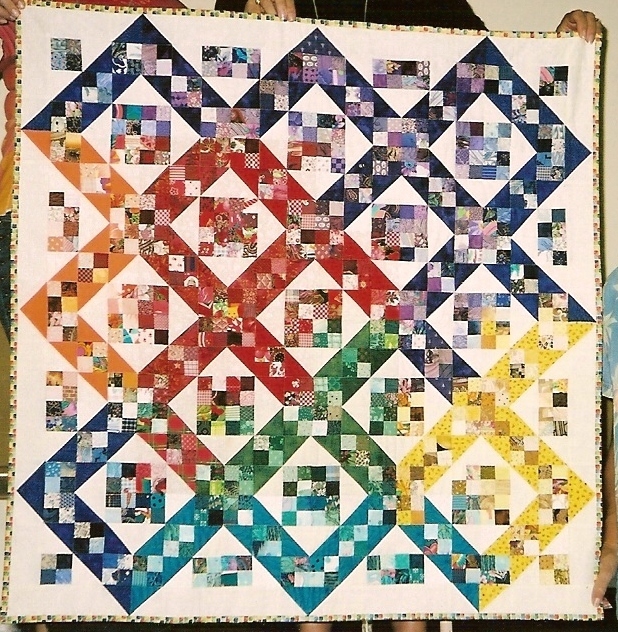 “Jacob’s Ladder” – I had collected 1.5 inch squares in an online exchange. I had no idea at the time what I was going to use them for, but I figured it was a great way to increase the stash. After several months of collecting I had amassed quite a number. They sat for a long time and soon became just a heap of "scraps". It soon came time to deal with them. After taking several days to sort them by colour, I sewed them into what I thought was a pleasing colour arrangement. I still had lots of little green squares left when I was done. This little quilt also went to the local hospital's neonatal ward. 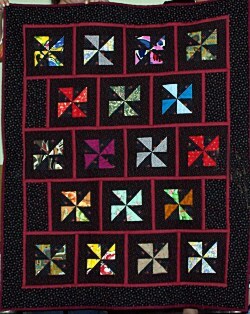 "Pinwheels Aplenty" – Remember the CIS Mystery Quilt that I posted about here. 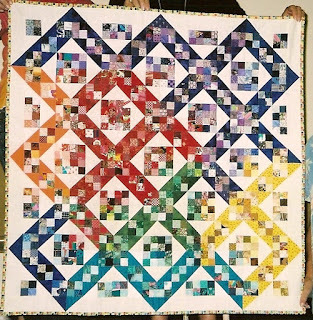 The pinwheels are made from the leftovers of the “CIS Mystery Quilt”. This was a bit of a challenge. After using all the HST to make the pinwheels, I had sufficient number of them to make a lap quilt, but I didn't want to put them into a straightforward grid. I ended up offsetting two rows which I thought looked pretty good. This quilt was donated to senior's care lodge so it could be distributed to a resident. I was very suprised when I received a thank you note from the recipient, because the label did not have my address but rather the address of my Guild. those itty bitty teeny blocks in the Jacob's Ladder are fabulous! A ton of work, but looks wonderful. I like the offset pinwheels, too. Great usage of your scraps. Such lovely work. I like the color arrangement of your Jacob's Ladder and the pinwheels are so effective on the dark background.